Detroit January 19, 2019; Without a single car or SUV on display, Volvo CEO Anders Gustafsson commanded a respectable crowd as keynote speaker of the North American International Auto Show last week. He addressed Volvo’s global sales record in 2018 and its pitch for subscription sales to bolster millennial business. With a smart phone, a customer can order a Volvo in less than 10 minutes, helping Volvo differentiate itself as the fastest to implementing new ideas and technology. The speech was the only offering from the Chinese/Swedish automaker who once boasted one of the most innovative displays with IKEA furniture and very blonde product specialists of both sexes showcasing the glistening vehicles. According to Gustafsson, new selling and leasing strategies could boost Volvo sales beyond its 2018 global record of 600,000 units. The first time it broke that number since the company was founded in 1927. The company’s sales rose 12.4 percent and reflected the fifth consecutive year of global sales record. In 2017 they sold 571,577. U.S. sales were up 2.8 percent to 60,157 cars and SUVs. Gustafsson believes subscription strategies will keep pace or exceed the growing trend toward complete packages with short term obligations. At the end of a year customers can swap out the model or continue for a second year. Subscription packages will also be offered on late model leases, keeping a stream of customers happy. Subscription services are popping up throughout the car business. Volvo first introduced Care by Volvo in Canada in summer 2017 at 37 Volvo retailers and in the U.S. in September 2017. BMW introduced Access by BMW in April, Mercedes Benz is consumer testing Mercedes-Benz Collection in Nashville and Philadelphia. Lexus offers subscriptions on its 2019 UX subcompact crossover and Jeep has Jeep WAVE. Toyota has KINTO based on the idea that cars are beloved. 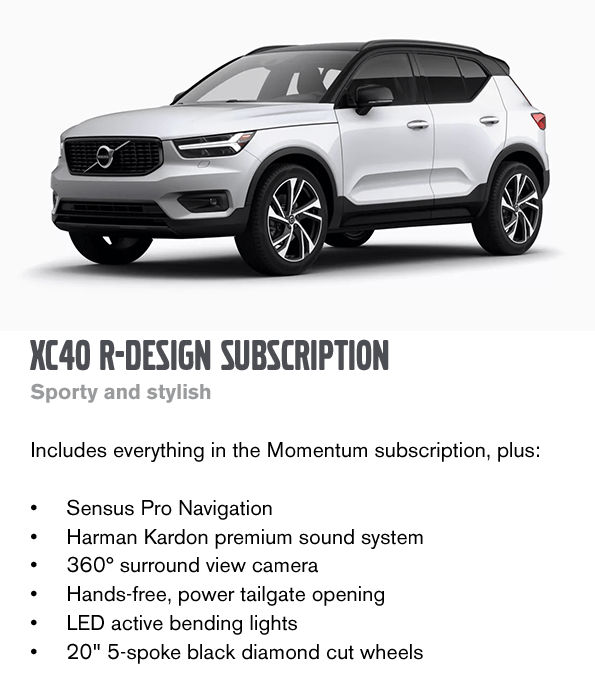 Subscribing to Volvo will cost $650 per month for the 2019 XC40, the most popular arrangement in the portfolio. This would include maintenance, 24/7 roadside assistance, both summer and winter wheels along with off-season storage, wear-and-tear protection, road hazard protection, concierge services along with the “intuitive technology and dynamic performance” each Volvo brings to consumers. Edmunds.com evaluated several subscription strategies finding only Volvo’s was less than an average lease but offered fewer advantages. Cadillac’s subscription service offered customers unlimited times to flip their vehicle, such as a sports car for a special weekend, or a big SUV to take the family on a vacation to Disney World, while most of the time you’d cruise in a small, gas-sipping SUV. Customers can still choose traditional purchasing and leasing options.